Thecontinuing high-octane adventures of America Chavez, Marvel’s lesbian Latina powerhouse. 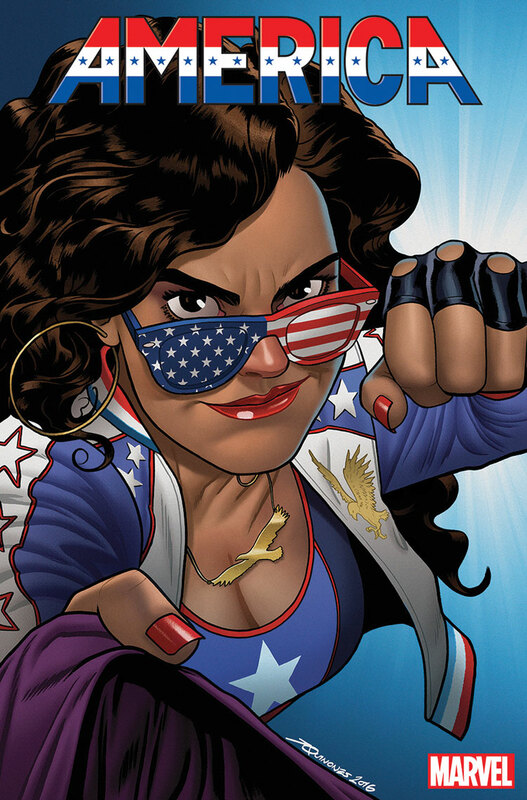 This spring, young adult novelist Gabby Rivera (Juliet Takes a Breath) and artist Joe Quinones (Howard the Duck) continue the high-octane adventures of America Chavez. Marvel’s lesbian Latina powerhouse, Chavez punches her way through dimensions and faces off against an oncoming alien horde all while managing her social life and trying to attend various classes on alternate Earths. Since her introduction in 2012, Chavez has stood side by side with Marvel’s most powerful heroes, and this year she’s ready to take the world by storm in her new series, America. We asked Rivera about her new series. How much does America’s sexual identity play in the series (i.e. will she be dating)? Comic creators, Marvel in particular, have amped up the representation game in comics. How do you respond to critics who say it’s too PC? There’s been a lot of suggestion that she is connected to a very big Marvel character. Is this going to remain a mystery? Totally. Mysteries make the Marvel Universe go round.